Diamond accented engagement rings can range from intricate designs, such as halo rings, to more classic styles, such as three stone engagement rings. Today, I wanted to combine the look of a three stone engagement ring with one of the most popular diamond shapes, the radiant cut. Radiant cut diamonds have brilliant faceting. A radiant cut diamond can either be rectangular or square, depending on the ratio of the diamond. Below are three of our most popular three stone engagement rings that feature radiant cut diamonds as the center stone. A radiant cut diamond is set into this setting and flanked by two baguette cut diamonds. The accent diamonds are tapered, giving the ring an elongated and elegant look. We choose G color VS clarity diamonds that will have a total carat weight of approximately 0.26 cttw. 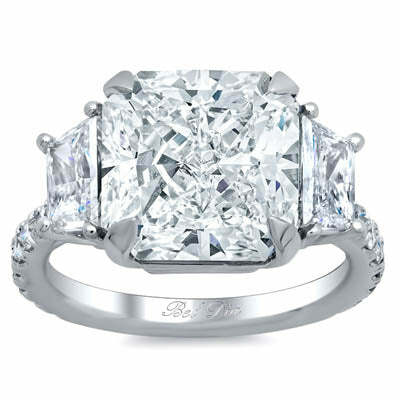 I love the addition of trillion diamonds in a classic three stone setting. 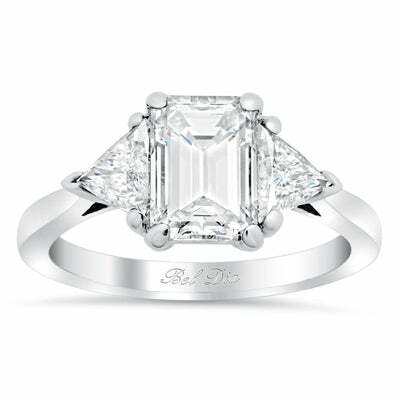 The shape angles of the trillion diamonds enhance the look of the center stone. The diamonds that we select will have G color VS clarity diamonds. The diamonds will have an approximate total carat weight of 0.50 cttw. 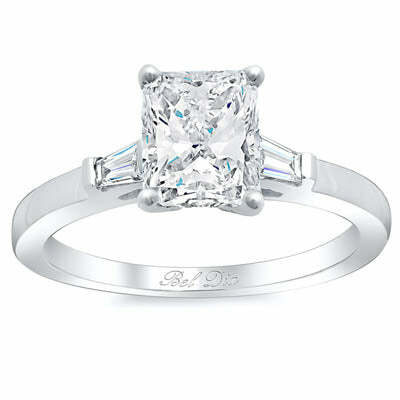 Please browse our entire collection of diamond accented engagement rings to see all of our three stone designs. We can customize any of our settings to your preferences.